Oh Hello World. I'm done hibernating for a while, and I have a computer that works! 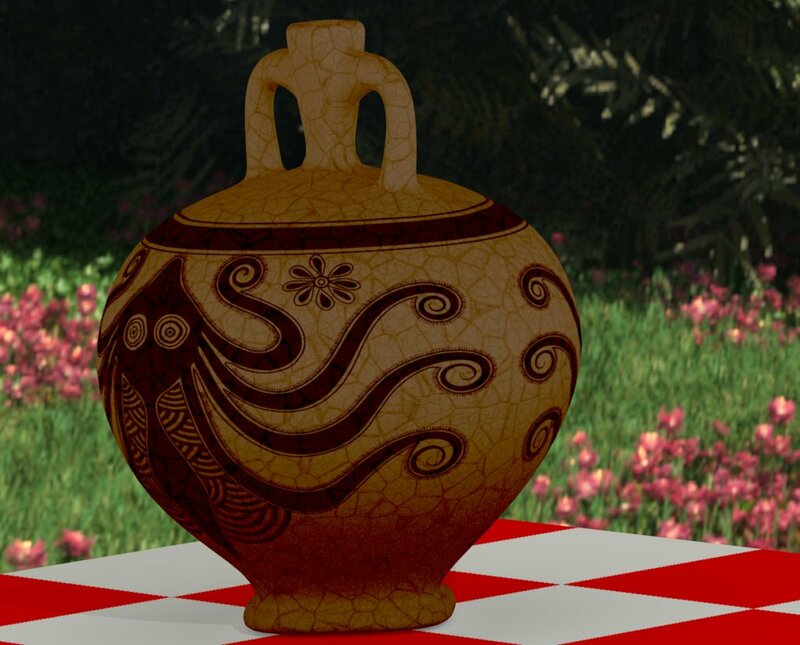 After this long break, I decided to start getting back into 3D modelling with an easy project: a vase. Sounds reasonable, right? So I grabbed some references of Mycenaean pottery, picked up one I liked, and started modelling it. That was easy enough... but the texturing? Silly old me picked up a model starring an Octopus! Gaaaah! I first painted it directly on the surface of the jar in Blender, just to give me a rough idea, but I then had to clean it up... Vector sounded like the way to go. Did I have a proper vector-editing programme? No, of course I didn't. So off to Inkscape I went. It's open-source. There's some nice tutorials for it (go to Inkscape kokeshi dolls for awesomeness), and if you already know the basics of Bezier curves, it's actually not that difficult to use. Then I started adding details... Dear-y-me. That version is a couple of days old. I've since realised that there's a third bit poking out the top -- and that my jar is what's called a stirrup jar, i.e. two handles and a beak. I've added the beak, presto! It means a new UV map, but it's an improvement on the old one so I don't mind a bit. The texturing is super-temporary, I've added some fish below the octopuses and scale patterns on the handles. I still need to populate the top of the jar. I'm quite excited about it. I've learned a lot already... including, and that's not the least of it: how to spell Mycenaean and the plural of octopus.